“No feces for this species.” “Carnivorous dung beetle shuns dung and decapitates millipede.” “Little dung beetle is big chopper.” “Dung beetle mistakes millipede for dung.” These were some of the clever headlines that I had to compete with in coming up with my own opener for a remarkable beetle that titillated the science blogosphere last week. At the risk of being redundant, I’d like to revisit that beetle and offer a few (hopefully novel) thoughts of my own. I can say that I have a unique and special treat for those willing to read further. First the background. Deltochilum valgum is a so-called “dung beetle” in the family Scarabaeidae that lives in the lowland rain forests of Peru. As suggested by its common name, it belongs to a group of beetles that are well known for their dung feeding habits. Over 5,000 species of dung beetles are known throughout the world, all of which carve out balls of dung and bury them as provisions for larval development – or so it was thought. As reported by Trond Larsen of Princeton University and colleagues in Biology Letters, D. valgum has apparently abandoned its ancestral dung ball-rolling behavior in favor of a predatory lifestyle. Its prey – millipedes! Moreover, the species exhibits several distinct morphological traits that appear to have evolved as a direct result of their predatory behavior. Adult beetles were repeatedly observed killing and eating millipedes, and their disdain for dung was rather conclusively demonstrated by an exhaustive, year-long trapping program in which pit-traps were baited with a variety of bait types known to attract dung beetles (e.g., various kinds of dung, carrion, fungus and fruit) – and millipedes. In all, over 100,000 dung beetles representing 132 species were trapped (what a nice collection! ), 35 of which were found to scavenge on dead millipedes, but only five of these dared tackle live millipedes. Of these, only D. valgum ignored all other foods – it only came to traps baited with live millipedes. Larsen et al. determined that adults of D. valgum are opportunistic hunters and were much more likely to attack injured millipedes than healthy ones, even those weighing 14 times as much as the beetle. Ball rolling behavior was never observed by D. valgum. Most dung beetles have wide, shovel-shaped heads used to scoop and mold dung balls, but D. valgum has a much narrower head with sharp “teeth” on its clypeus (Fig. 1A vs. 1B). The teeth apparently aid in killing the millipede by piercing the ventral surface behind the head and prying upwards (decapitating it), and the narrow, elongate head facilitates insertion into the millipede body for feeding. Further, the hind tibia are elongate and curved, which are used to “grip” millipedes by holding them up against the dorsally reflexed pygidium (Fig. 1C vs. 1D). This allows the beetle to drag its coiled up victim with one hind leg while walking forward on the other five (Fig. 1E). Once killed, the beetles proceeded to break their prey into pieces and consume their meaty innards, leaving the disarticulated millipede exoskeletons licked clean (Fig. 1F). One of these “attack” episodes was filmed (using infrared lighting so as not to affect their nocturnal behavior) and can be seen in this BBC News video. segments; disarticulated empty millipede pieces nearby. Credit: Larsen et al. (2009). Yes, I would very much like to know what the reproductive/nesting behavior of D. valgum is. My best guess is that they also use millipedes as a larval food source, but as you say, we haven’t observed that behavior yet. I have observed other generalist dung beetle species rolling balls out of dead millipedes, presumably to bury for the larvae, so I certainly think it would be an adequate food source. Many dung beetle species use carrion for their larvae. I am quite confident that D. valgum does not use any kind of dung. I have sampled these dung beetle communities very thoroughly, with many dung types and other bait types, and also with passive flight intercept traps that catch all beetles. Every dung beetle species that feeds on dung is at least sometimes attracted to human dung (this is not the case in African savannahs though, but is in neotropical forests – that is a whole different story). There are still a small handful of species we catch in flight intercept traps that we don’t know what they eat, although some of these mysteries have recently been solved – many of them live in leaf-cutter ant nests for example. While predation of millipedes by a dung beetle is itself a fascinating observation, demonstrating the abandonment of dung provisioning in favor of captured prey for larval development would be a truly remarkable example of an ecological transition to exploit a dramatically atypical niche. I hope Trond (or anybody for that matter) actually succeeds in observing millipede/prey utilization for larval provisioning by this species. Many thanks to Trond Larsen for his delightful correspondence. Larsen, T. H., A. Lopera, A. Forsyth and F. Génier. 2009. From coprophagy to predation: a dung beetle that kills millipedes. Biology Letters DOI: 10.1098/rsbl.2008.0654. This entry was posted in Coleoptera, Diplopoda, Scarabaeidae and tagged beetles, chemical defenses, dung beetles, entomology, evolution, insects, literature, millipedes, nature, Peru, predation, predator avoidance, scarabs, science. Bookmark the permalink. 11 Responses to Done with dung, meat please! You raise an interesting question here on their reproduction Ted and it makes me wonder about it myself. I must say that these seem to be most vicious beetles!! I also wonder if this is something D. valgum have adapted to because of the scarcity of dung in these regions? Were they dung rollers before switching over to millipedes? Hmmmmm!! Something for me to maul over in my mind. I suppose you are aware that South Africa exported dung beetles to Australia bout 20-25 years ago to held out there with a soil erosion problem that had? We in turn received from them a bug which eats hyacinth as it was a great problem on certain of our dams and rivers. Another interesting and well done article! Joan – yes, certainly D. valgum originated from a dung ball-rolling ancestor. Larsen et al. speculate that it was the intensity of the competition (132 species of dung beetles captured in their surveys) that drove the species to specialize on millipede predation. That is a relatively untapped resource for which there is far less competition due to the millipedes’s chemical defenses (cyanide!). Actually, the South African dung beetle species, Digitonthophagus gazella, was introduced into Australia to help process dung from (likewise introduced) livestock. Digitonthophagus gazella has also been introduced into the US – they have expanded tremendously from their initial release sites and can be found processing livestock dung across the southern part of the country. I do have some concerns about whether they have displaced native dung beetle species, although I’m not certain whether this is the case. this is indeed an interesting article. I was just very surprised with the evolutionary physiological adaptations . Luv the bugs. Great blog. Could do without the dung; but it’s gotta be dealt with somehow; so thank goodness for dung beetles. Hope they ALL don’t stop eating… it. Care-aware: that would be “Carpe carnem” in good Latin. Anyway, Ted: This is great stuff. Thanks for reporting this fascinating evolutionary tale. The following Revision is an online description of a millipede-consuming species of Scarabaeinae, (Dung Beetle genus). 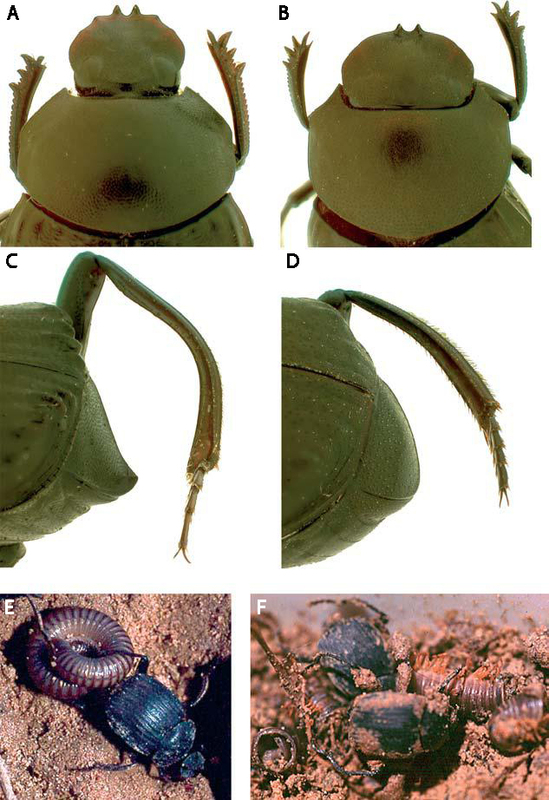 “Revision of Sceliages Westwood, a millipede-eating genus of southern African dung beetles (Coleoptera: Scarabaeinae)” As, described, the larvae of Sceliages are fedfrom balls of crushed millipedes, provisioned within the underground brood chambers by attending adult females. Another Deltochilum species from Brazil attacks and dimembers large Atta ants for prey. Thanks for the reference – this does seem to support Trond’s suspicion that Deltochilum valgum uses its millipede prey for larval provisioning and not just adult nutrition. Such a complete shift from coprophagy to predation and its associated provisioning really is quite remarkable. I live in Pietermaritzburg, South Africa. I recently encountered dung beetles pushing dead millipedes along a road – probably with a view to burying them as a food source for their larvae, The millipedes were intact – and, at least in one instance, has a nymph of the millipede killing reduviid (Ecthrichodia crux) present and feeding on the millipede. I have some photos – but did not collect the beetles or millipedes (being a dipterist myself). I would like to know what was going on and if any beetle specialists have ever seen this behaviour before. I don’t know if such behavior has been seen before, but it certainly sounds possible they are using them for food. If they are, whether they are actually killing them or just scavenging millipedes already killed by E. crux would be a question. Sounds like you have a good project to work on—even if it isn’t related to flies.